Judging from this Holden’s taillights, this is probably a Holden HQ series Kingswood, built in Australia from 1971-1974. This one, though, puts out a lot more power than when it first came off the assembly line, or over 800 horsepower, if this video is to be believed. Whether that horsepower figure is accurate or not, this Holden efficiently turns tire rubber into smoke and that’s enough for us. 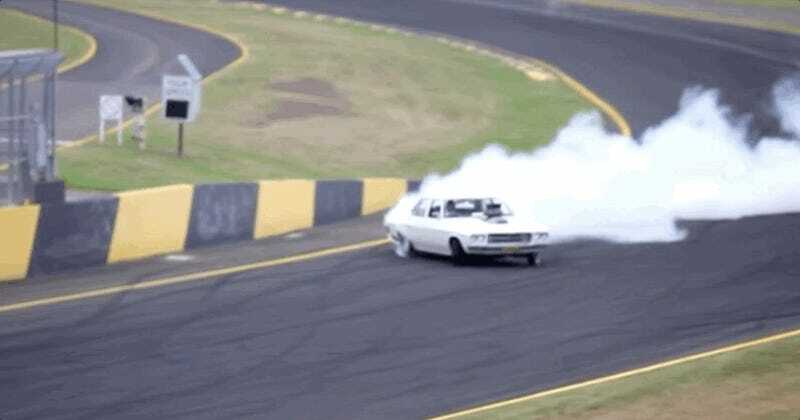 Part of the fun of the video is the slow, uh, burn of it, as the Holden calmly pulls out onto the main straight at Sydney Motorsport Park before absolutely wrecking its rear wheels. Kingswoods were once the most popular Holden in Australia, now part of folklore, representing, for a certain generation of Aussies, one fulfillment of the country’s promise. It’s good to know they’re still alive and more than kicking.